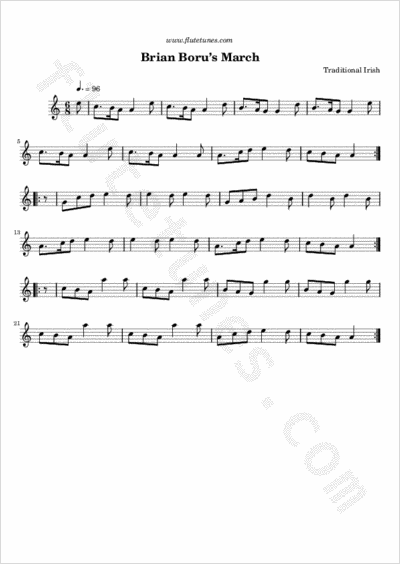 This tune is one of the oldest tunes in Ireland's traditional repertoire, yet it is still widely played by traditional Irish musicians. Brian Boru, also known as Brian Bórumha, is sometimes referred to as Ireland's greatest king. He reigned for 39 years, from 940 to 1014, and it was a time of unsurpassed glory, prosperity and happiness. He promoted the arts and learning, and is even credited with having originated surnames. His patriotism and personal sacrifice brought the clans together, under one king, for the only time in Irish history. He was eighty-nine when his army faced the armies of the Norsemen at the Battle of Clontarf. Brian's warriors won the day, but soon afterward Brian was murdered in his tent. The music of this march is wildly powerful and at the same time full of melancholy. It is both a music of victory and of mourning.